The National Renewable Energy Laboratory (NREL) issued a long-delayed report this past summer on Geothermal FIT Design. The 82-page report by Wilson Rickerson and Karlynn Cory is the most recent in a series of NREL reports on feed-in tariffs and how they can be used in the US. The report is significant in the North American context because it is issued by a one of the US government's own research laboratories, and that it specifically addresses geothermal energy. Most North American renewable energy advocates, EnNGOs, and other erstwhile energy policy wonks have consistently ignored the potential of geothermal energy. Yet through 2010 geothermal energy contributed nearly 13 TWh of generation in California, meeting 4.4% of demand. This was twice as much as either wind energy (2%) or biomass (2.1%). And there remains substantial untapped geothermal potential in California. As much of 7% more of California's demand can be met by distributed geothermal development. One of the most useful elements of the report is a thorough review of geothermal feed-in tariffs worldwide and the assumptions various countries used to calculate the tariffs needed for geothermal. Here are some other salient findings of the report. 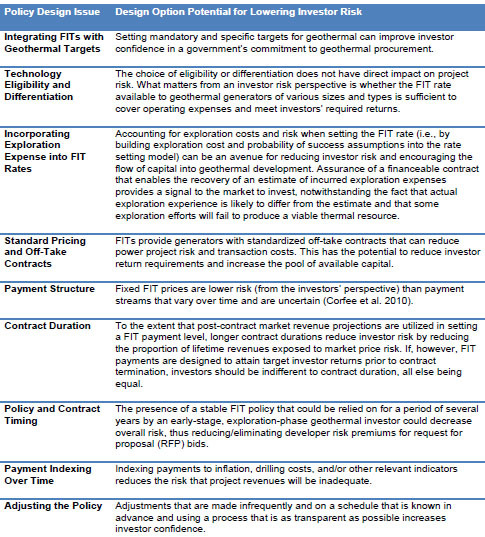 "Feed-in tariff (FIT) policies can be designed to address some risks specific to geothermal power plant development, although they have not been used in the United States to date. . .
"The guarantee of a stable revenue stream over the life of the generation plant lowers the risk that large investments in exploration and development will not yield an off-take agreement. 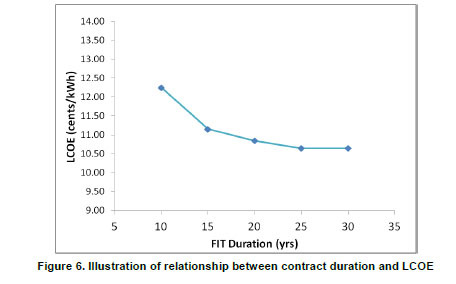 The combination of a guaranteed purchase, a pre-determined payment price, and a standardized off-take agreement can relieve some of the cost, risk, and pressure associated with overall project development since the project does not need to compete for or negotiate a contract before final project costs are known. . .
"FITs are currently the most common national renewable energy policy in the world and are in place in over 50 countries. 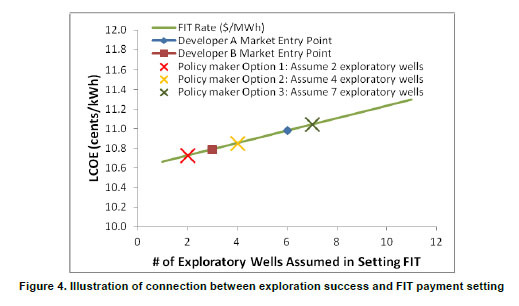 Despite international interest in FITs, there has been a limited focus on geothermal FIT design specifically. This report represents the first in-depth attempt to explore how these policy elements could be aligned to support geothermal development. . .
"More than a dozen countries are experimenting with FIT policies that are specifically tailored for geothermal technologies . . .
"Geothermal market growth under FITs has been slow to date for a variety of reasons. These include the fact that many of the FITs are comparatively new, and that some of the prices are too low to support the comparatively poor quality, or expensive local resources. . .
Geothermal FIT Design: International Experience and U.S. Considerations, Technical Report NREL/TP- 6A20-53320, August, 2012.